Roasted Brussels sprouts paired with a Wisconsin Original cheese. The savory combination creates an unbeatable flavor. Add some chopped thick-cut bacon for a side dish that will leave you coming back for seconds! An out of the ordinary side dish to serve at Thanksgiving, Christmas, or and special meal! Heat oven to 400°F. Toss Brussels sprouts with olive oil in a large bowl. Lightly season with salt. Arrange Brussels sprouts in a single layer on two 15 x 10-inch baking pans. (Do not crowd.) Bake for 30-35 minutes or until tender, turning occasionally. Meanwhile, chop bacon into 1-inch pieces. Cook and stir in a large skillet over medium heat until crisp. Remove bacon with a slotted spoon to a paper towel to drain; reserving 1 tablespoon drippings. Add shallots; cook and stir over medium heat for 5-6 minutes or until tender. Remove shallots with a slotted spoon; set aside. 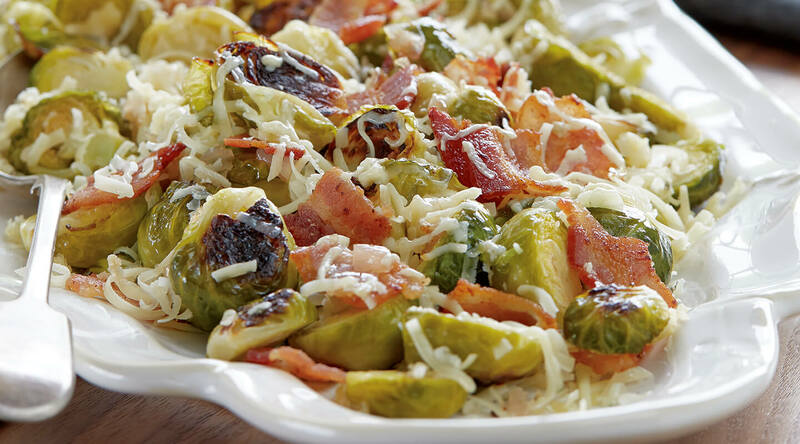 Combine the Brussels sprouts, reserved bacon and shallots in large bowl. Add Dunbarton Blue; lightly toss. Season with pepper to taste. ← Easy, Cheesy, and Delicious!